Chilled Lettuce Soup, Thyme for Cooking summer soups. Why not? We make soup of cabbage, spinach and other greens. 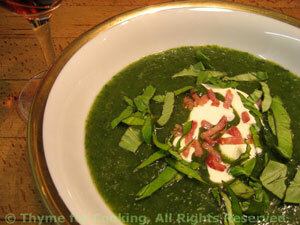 Lettuce Soup is a bit more delicate, depending on what types of lettuce used. I would suggest using dark green varieties and not adding any purple - it could be a strange color. It can be made ahead and served cold, straight from the fridge. I used the outer leaves of heads intended for later in the week. Heat oil in saucepan and sauté onion for 2 minutes. Add potato, stock and bring to a boil. Cover and simmer 15 minutes. Uncover the saucepan and stir in the lettuce and tarragon. When lettuce has wilted (almost immediately) remove from heat and purée in a blender. Set aside to cool to room temperature or refrigerate for colder. Remove, drain on paper towel and crumble. When ready to serve ladle soup into bowls, dollop 2 tsp of yogurt onto each serving, sprinkle with bacon, a bit more shredded lettuce and serve.